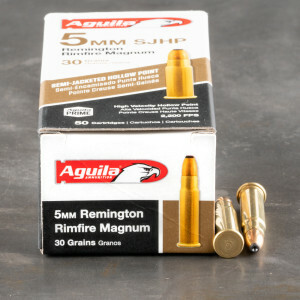 5mm Remington rimfire magnum ammo is an extremely fast and versatile rimfire round designed by firearm and ammo manufacturer Remington arms. The cartridge was designed in 1969 for two bolt action rifles. Although the round was designed for Remington bolt action rimfire rifles, both Thompson Center arms and Taurus produced firearms for the caliber. Great ammo. I hope it becomes available again soon.